How to organise toys before Santa arrives! Santa arrives. Does this fact leave you with a feeling of dread? Are you struggling to keep on top of the toys the kids already have? We really have far too much nowadays, and what the kids own is no exception. Christmas and their birthdays are good markers in the year to take some control of the disorganisation and the build up of toys, games, books, and other items they own. To give you a hand on what can be a tricky project, here are my top 10 tips to help you organise the toys. We wouldn’t want Santa stepping on LEGO now, right?! When organising toys, think from the child’s perspective! This is about putting toys in homes where they will find it easy to put them away to and find them again. Not necessarily where you’d like them to be! Accessing toys and putting them away needs to be as easy as child’s play. To help with that, go for containers without lids. And add photo labels of the toy inside. This will encourage the kids to tidy up their own mess. Only keep toys that the kids love or the ones that truly have sentimental value and mean something to them. 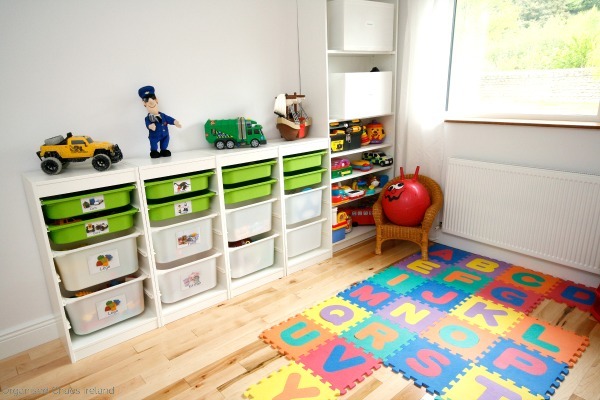 A dedicated toy room may not be feasible or even necessary in homes. Toy rooms are more messy than tidy. Do you always want to be looking at that mess? If you’re ok with that, and like the idea of toys in one room – then go for it. Otherwise, toys in the bedrooms and smaller toy nooks in the living room might work better for you. 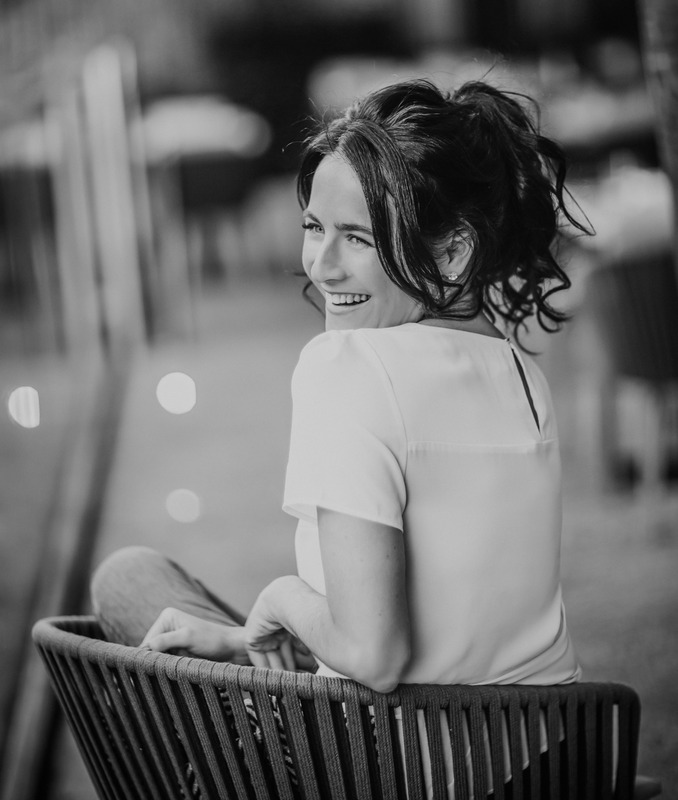 During a decluttering session, categorise toys – One pile that will stay, a second pile that can definitely go (it’s not necessarily important to share this information with the kids) and a third pile that you can run by the kids, this can also be used to teach the kids about decision making and the importance of decluttering. Where possible, remove packaging! You can fit toys – and other items for that matter – into spaces and containers more easily by removing packaging. Packaging often restricts use of a space, whereas you can get more in without the plastic! 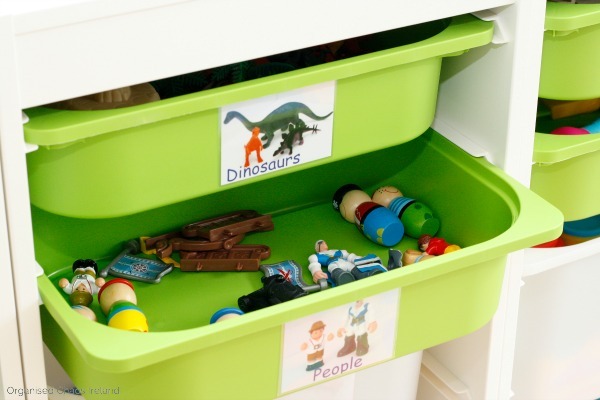 Use containers on wheels for toy organisation. This way the kids can roll the toys out into the middle of the room to play. And then the storage or ‘home’ is right next to them come tidy-up time! When it comes to the furniture in a toy room, nothing should be in the way of it. For example, a toy chest in front of a press won’t encourage anyone to use the press and tidy toys away into it. Remove any obstructions so you can easily get to that good storage space! When you are categorising toys, keep the categories very broad. For example, don’t organise the LEGO by colour. Or don’t match all the figurines to the original pirate ship or train set – just put all figurines together. It’s easier for the kids to find and tidy up later. Use colour to help kids organise. If you have more than one child, assign different colour bins or containers to each child so they know where to put their toys. This idea can be extended up to their bedrooms too! 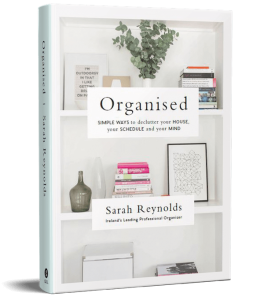 For lots more tips on organising toys…and other rooms in the home, check out my book ‘Organised – Simple Tips to Declutter your House, your Schedule and your Mind’ – click here!